Voted Best Business Opportunity of the Year for the Last 7 Years! Highest rated Vending Business Opportunity Company in the US. Our focus has always been on helping people start a vending business that fits their lifestyle. TheNaturals2Go brand launched in early 2009 and has grown rapidly since. 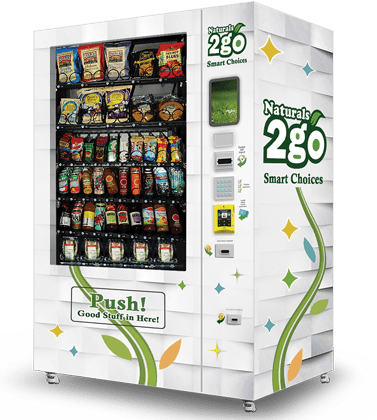 As an innovator in healthy vending, Naturals2Go created a whole new industry that continues to grow. We are proud of taking home the “Business Opportunity of the Year” award from the prestigious Franchise Brokers Association for the 7th year in a row! Naturals2Go a division of Vend Tech International, Inc. A trusted partner for over 30 years helping the entrepreneurial minded startup businesses across the world. Our team of staff On Site Locators secure every location for you! Every Naturals2Go business package includes On Site Locating by one of our professional staff locators. This means, we send our staff member to your city. You'll work side by side with them, and watch how they secure the best locations for all your new Naturals2Go machines. Our Lifetime Location Guarantee insures you will always have your machines in the best performing locations possible! Healthy vending is a booming business that continues to grow. Several factors occurring at the same time make this the ideal moment to start your own healthy vending business NOW! The idea of a franchise, with all but guaranteed success is appealing. We give you that level of comfort and support, with no fees! We may not be alone in the Healthy Vending world, but we are certainly on the top. A+ BBB ratings and other accolades ensure our success depends on your success. The fact that our ownership and coaching staff own vending routes means they know what you are going through. They know how to help you avoid the pitfalls, and grow your business smoothly. Naturals2Go is THE LARGEST Healthy Vending company in the United States. With nearly 10,000 machines onsite, and growing everyday. BaseCamp is a one of a kind comprehensive training and support system. Training classes are led by a veteran in the vending industry and backed by our online portal, Basecamp. Everything you need to be successful in the healthy vending field is right here. Online ordering of equipment, special offers from product suppliers, private forums to talk with other operator, and your own operator dashboard to customize and create your very own website!